Welcome to a new feature we're calling "Show Us Your Space." 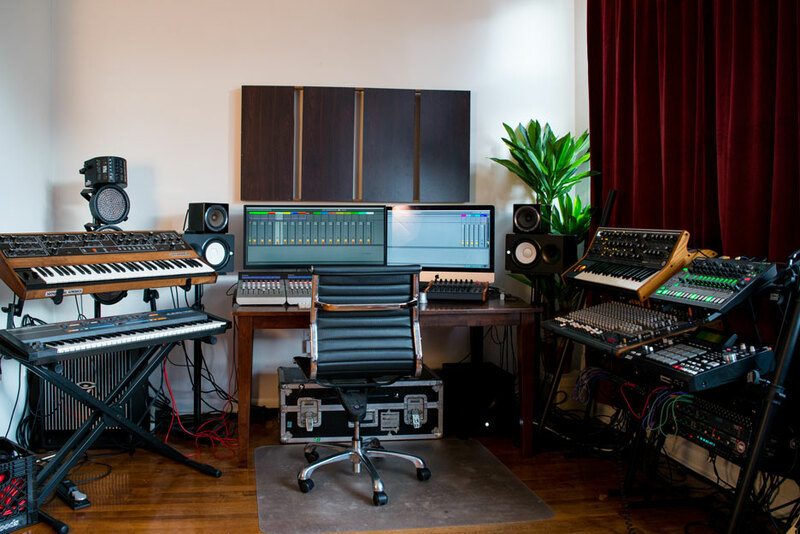 In this series, we're inviting producers and music–makers to send us photos of their workspaces with some description of how it all fits together. From basic electronic production rigs to professional studios with historic consoles and enormous live rooms, we're interested in exploring and showcasing all sorts of unique and inspiring music spaces. 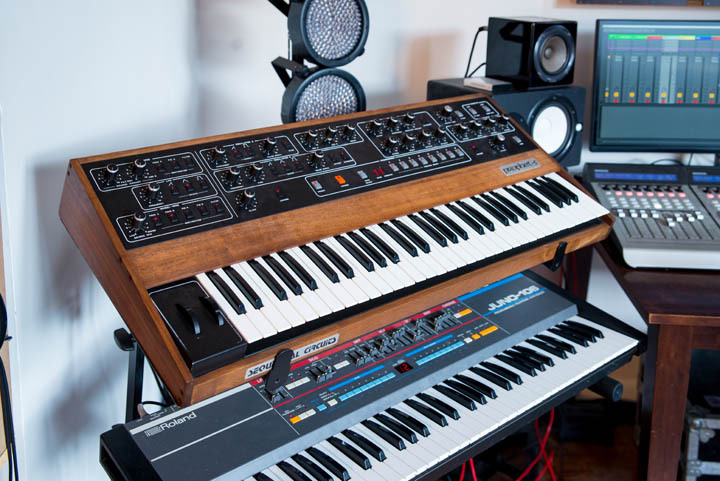 We thought we'd kick things off with a trip to the home studio of our very own Justin DeLay who you might remember from such landmark Reverb videos as the Synth Sounds of Stranger Things. 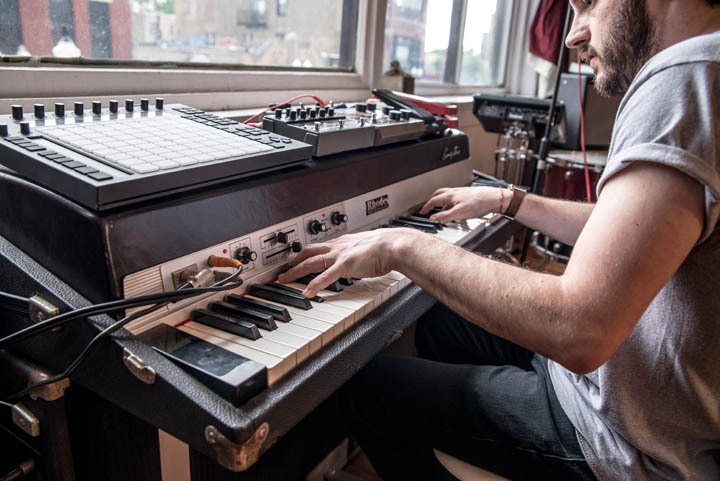 Take a look below for a tour of Justin's remarkable synth collection and how he pieces it together in his Chicago apartment. 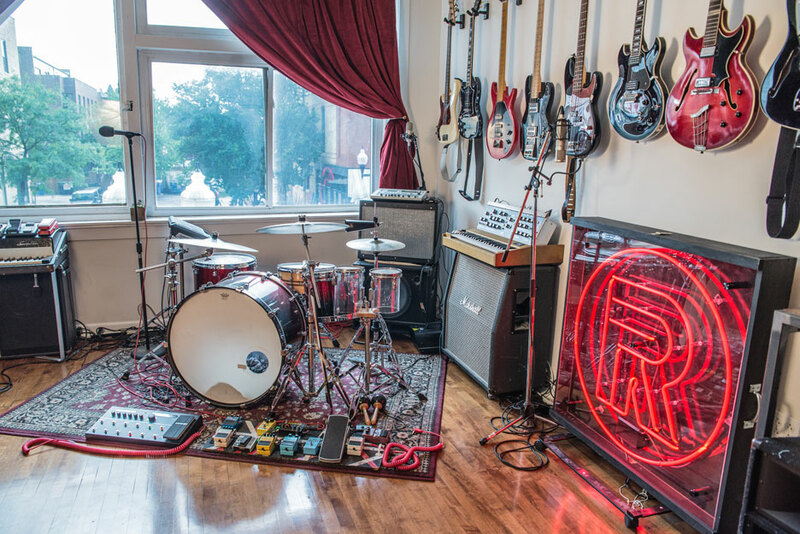 Have you assembled an awesome music space that you want to show off? Contact us at showusyourspace@reverb.com. This is my home studio, where my band Replicant produces all of our music and live shows. We are a hybrid band, with drum machines and synths supporting live guitar, bass, and vocals. The neon sign was custom built by an awesome artist who has been making neon signs in Chicago since the ‘80s. We use it live as part of a DIY lighting rig sequenced by Ableton Live. I like to keep my electronic instruments synced up and ready, so that I can just hit play and start jamming on sequences and loops. I’ve spent a lot of time getting my Ableton Live default session customized. I highly recommend building a default template with all of your instruments assigned to tracks and any routings you will use pre–defined. It saves countless hours and makes it possible to record before the inspiration disappears. 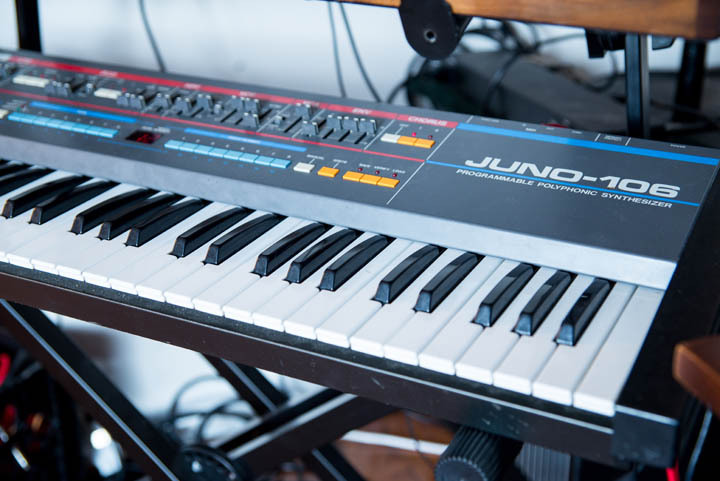 The Juno was my first synth and the core of my sound. I love it so much that I installed the KIWI mod to add an arpeggiator, additional envelope and LFO, and a ton of other awesome features. It takes the classic Juno sound and removes the compromises. Everything said about the Prophet 5 is true. 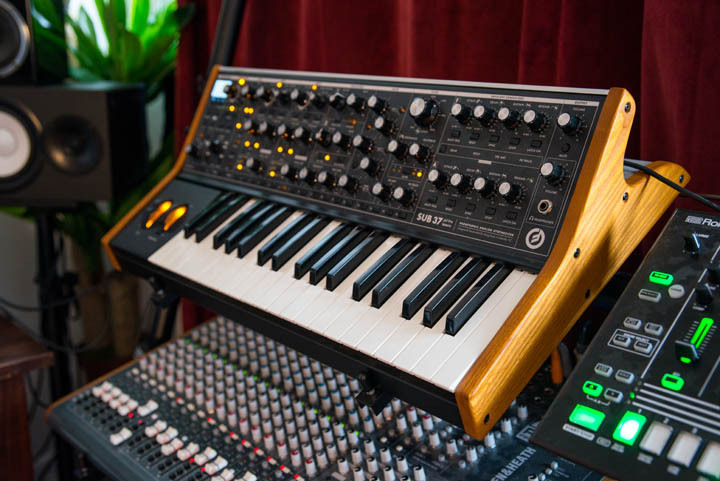 It sounds huge and deep and gnarly — a great compliment to the more refined Juno sound. I had a Wine Country MIDI kit installed and had the Prophet reconditioned. Replacing the worn out electronics was like taking a blanket off of the tone. It’s a finicky beast but worth the trouble. 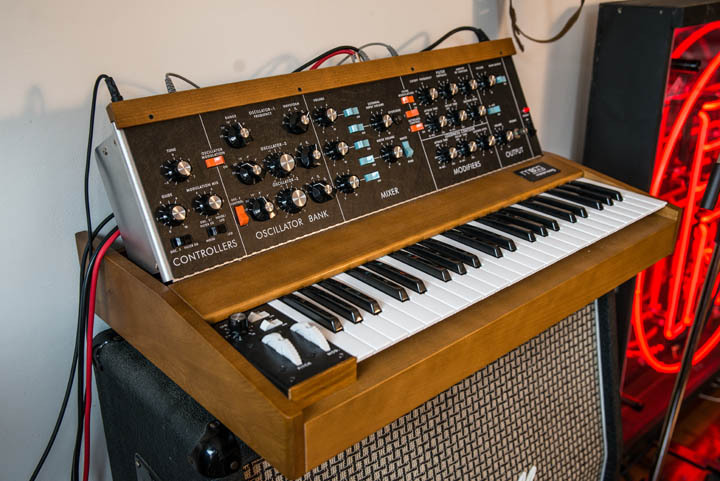 Moog tone, tons of deep modulation, and a sequencer that provides endless hours of fun and inspiration. The Sub 37 can get as weird as you want it to, but I mostly use it for sequenced bass lines. 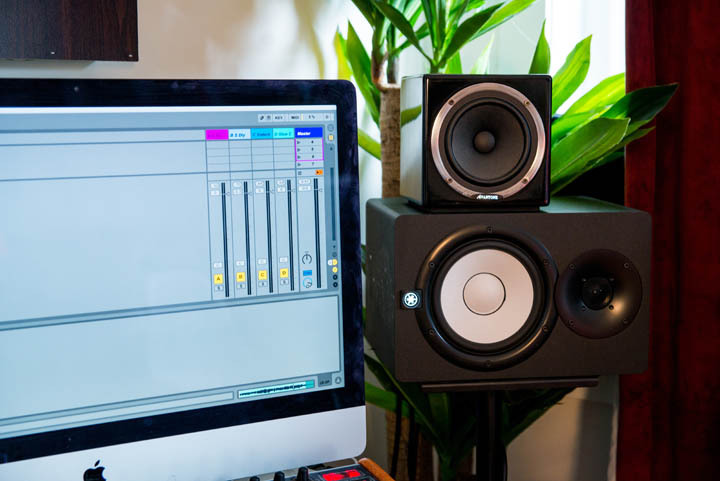 The plugin editor makes it easy to fully integrate into a DAW workflow. A modern classic. I was lucky enough to get reissue #24 when the synth was announced at Moogfest a couple of years ago. By patching velocity to filter cutoff and aftertouch to pitch, the Model D becomes incredibly expressive and nuanced. It’s limited in its architecture, but it’s a classic for a reason. The Korg Mono/Poly is my favorite synth. It can go from cutting basslines to screaming leads to the most whacked out sounds in my studio. Almost modular in its architecture, the Mono/Poly is my “happy accidents” synth. 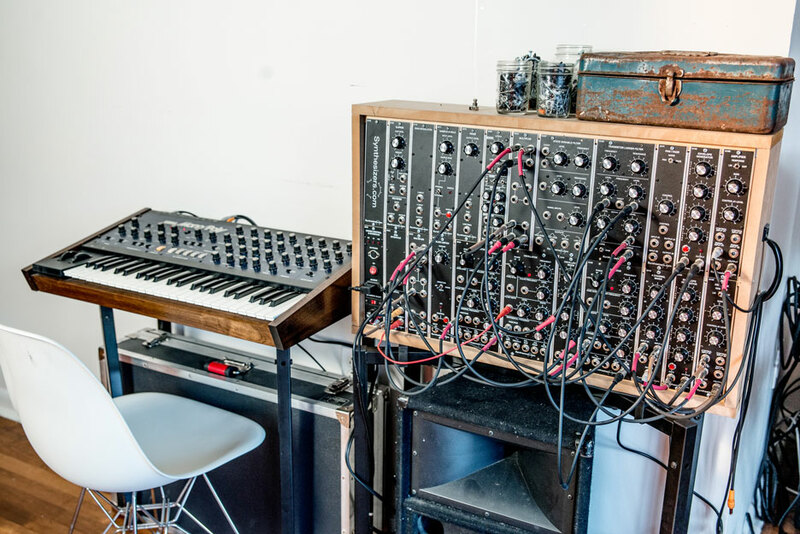 The Synthesizers.com modular is a recent addition. It’s a three–oscillator setup with ladder and multi–mode filters. It sounds absolutely huge but requires a slower, more deliberate approach. 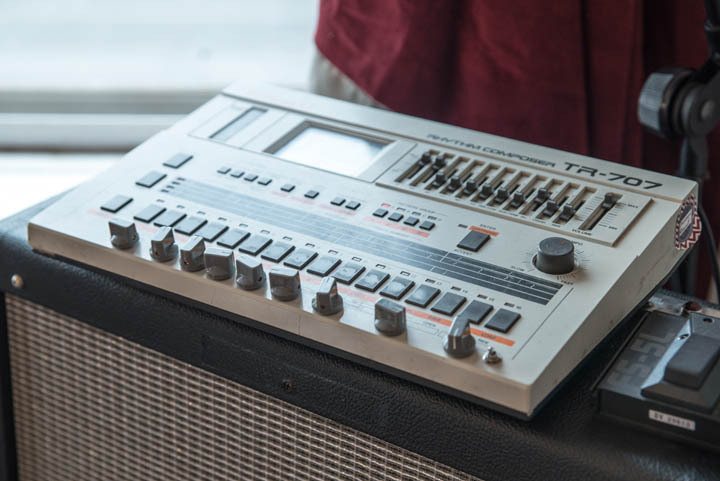 My sound is based on the classic Roland drum machines, and the TR–8 is an amazing value. I’ve expanded it to include the 707, 727, and 606 sounds, which greatly expand the dynamic range. I route low–frequency sounds through the left channel and high–frequency sounds through the right channel as a quick and dirty way to multi–track. I love the random pattern generator for inspiration and the sidechain input is awesome for glue a synth bassline to the drums. I took a black Sharpie to the green border- I can only handle so much neon green. 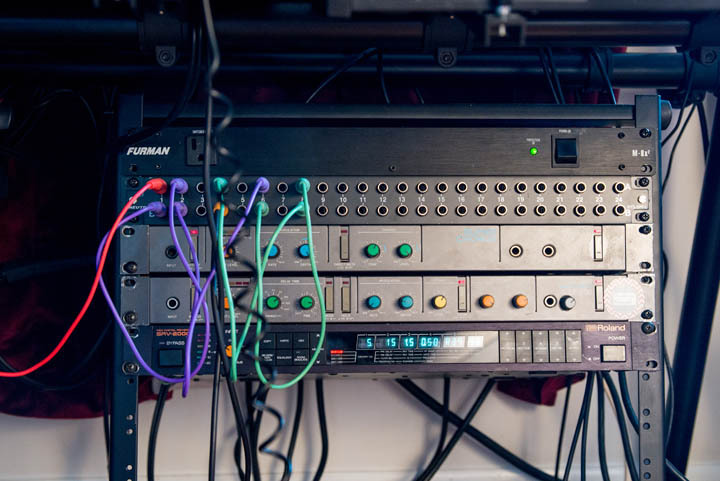 My first and still favorite drum machine, the 707 sampled drums cut and punch through a mix, and the simplicity of the interface makes it easy to get a drum loop going fast. I had my good buddy at Danieldialatone add individual tuning to each sample via the knobs below the step buttons. This lets me dial in a slightly detuned kick and snare for more bottom end, and creates some awesome glitches and noise when the cymbals are pitched way up. I’ve used everything, but Ableton Live just clicks for me. All of my music starts with a jam, and I love cutting out the best bits of a long session, arranging in session view, and building my tracks. The Mackie Control has been a huge workflow improvement for me. 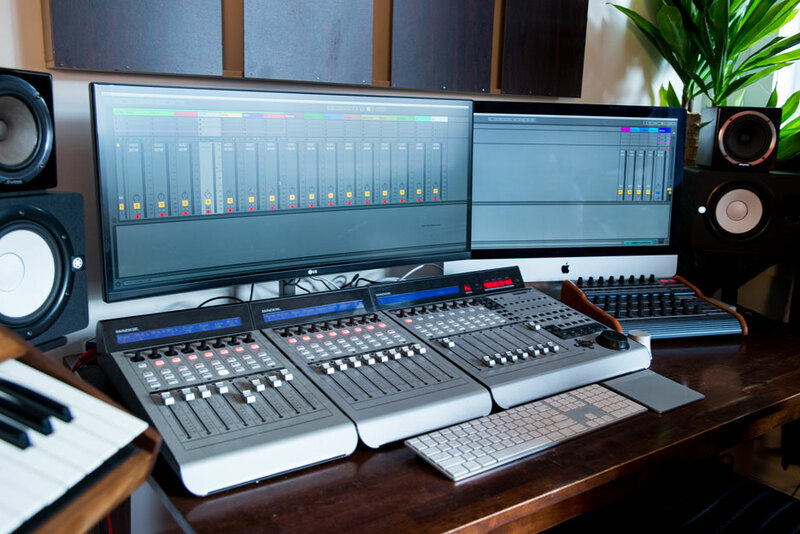 I try to avoid using a mouse and keyboard when making music, and the Mackie gives me more of the classic console workflow. This started life as a Behringer BCR2000, a killer MIDI controller for the money. 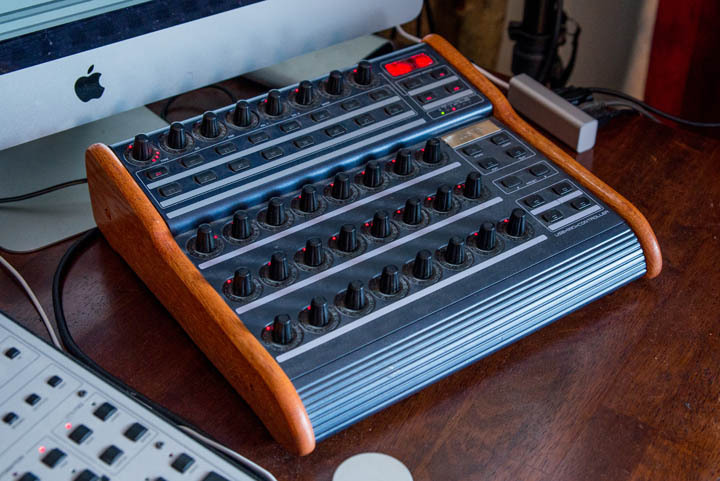 My father crafted the wood side panels, and I installed custom firmware from a company called ZAQuencer that turns the BCR into a MIDI sequencing monster. 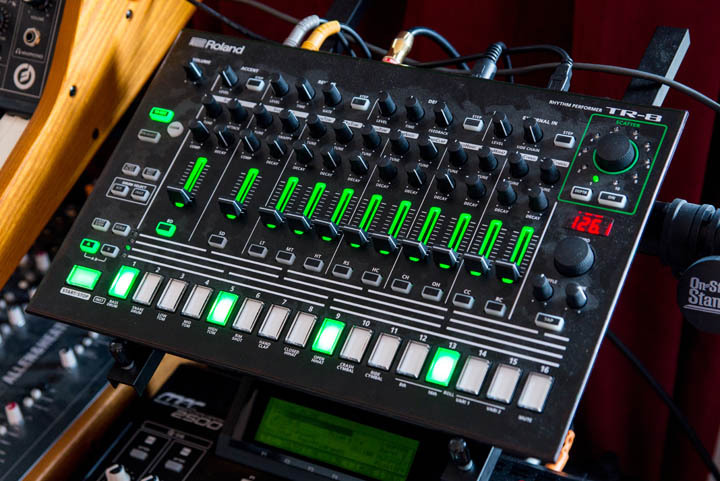 Seriously, for about $200, this thing can do sequencing tricks that super expensive sequencers can’t. I love old rack effects for their imperfections. 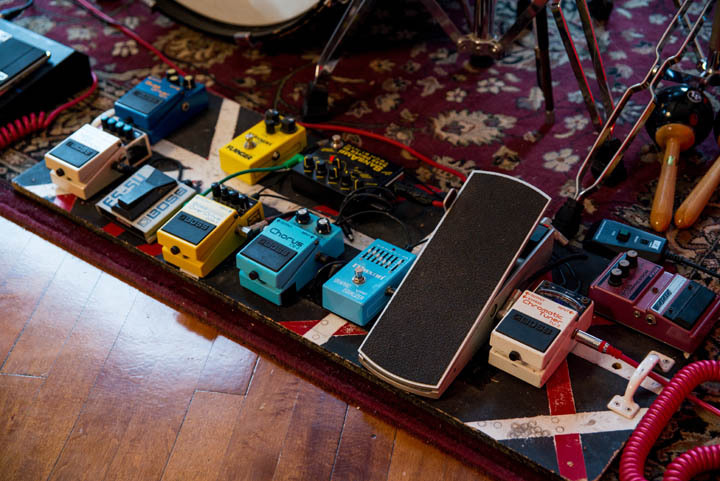 The Boss Chorus analog CE–300 and Delay DE–200 were originally designed for guitar. I had my buddy mod them to accept live level. The chorus is the closest I’ve found to a Juno, and the delay has a beautiful early digital character. The SRV–2000 Reverb is a secret weapon for me — absolutely spot on ‘80s digital reverb. I have the three units chained together on an AUX buss on my mixer, and then record the output as a separate channel. I like to commit my sounds to audio as quickly as possible to force constraints. I’ve learned everything I know about production on these Yamahas. Excellent monitors for the money, especially with the subwoofer. The Avantones are great for checking midrange and getting a sense for how a mix will translate on consumer–level speakers. I highly recommend using two sets of monitors while producing. It’s like getting a second opinion at the flip of a switch. I really love the old hardware mixer workflow, and the Allen & Heath ZEDR16 is really special to me. 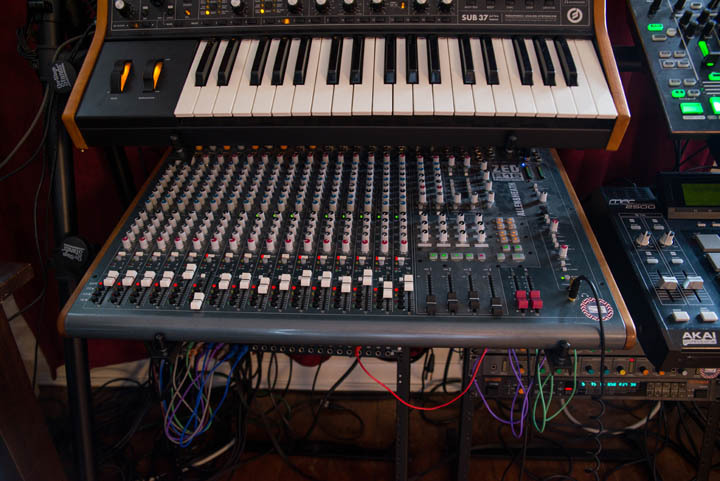 It’s one of the only hybrid mixer/audio interfaces on the market. 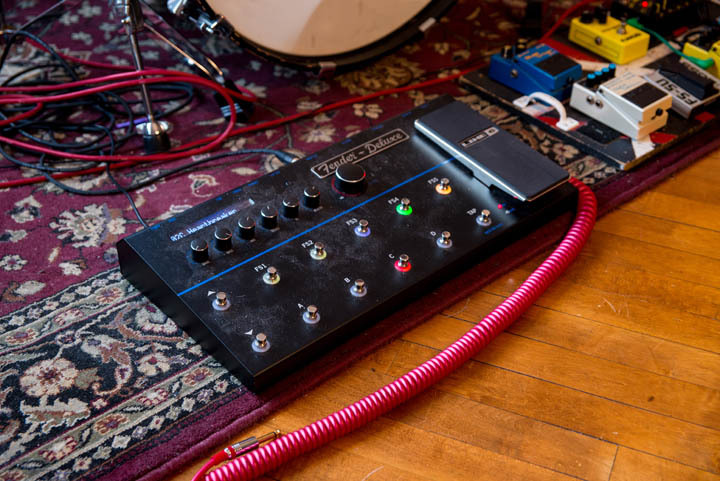 It has been rock solid, sounds great, and is hugely versatile for routing and studio control. I had custom wood sides made by MixingTable.com and my buddy Danieldialatone hot–rodded channel 16 as a dedicated vocal channel. I’ve played guitar my whole life and have owned Marshalls, Fenders, Mesas, Soldanos, and more. While I still prefer the sound and feel of a cranked half stack, the current generation of guitar modelers can’t be beat for live performance. Garret, the guitarist in Replicant, has an excellent ear for tone. He was skeptical at first, but after diving in and tweaking the patches, we’ve been able to craft a wide range of tones that just work. My brother Jordan plays bass in Replicant. The core of his tone is a Fender P–Bass running through a Keeley–modded Boss CE–2 chorus. The Tech 21 Sansamp is an awesome DI for live. We dial in a bit of grit but generally keep the bass tone pretty clean. This is my favorite instrument. I’ve been in love with the Rhodes sound my whole life and recently took it to a whole new level by adding an old EHX Deluxe Memory Man, Eventide Space Reverb, a Big Muff, and Digitech Whammy 2. The tone of the Rhodes is so pure that it makes an excellent foundation for effects. I can create guitar, bass, and synth tones through simple pedal combos.